I know Mom promised food programming was returning after the big party our country has been having since the election but she got waylaid today with a long day of meetings in Providence, RI and then delays on the Amtrak line between Boston and NYC owing to rain and fog. She just got home and immediately went to bed after feeding me some tuna fish. She left the computer on so I could write the Weekend Cat Blogging post, especially since we're hosting this weekend! 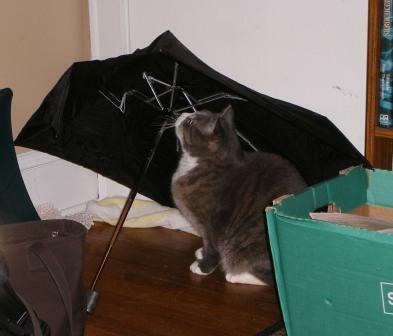 Speaking of rain and fog, look what happened to Mom's umbrella she keeps in her briefcase. A big gust of wind broke it on Wednesday afternoon but I'm glad she didn't throw it away because it made a good hiding place. Mom hadn't used the briefcase in quite a while because when she opened it up she found one of my favorite toys, my laser pointer! Mom also decided to play with a new feature she figured out how to use on her digital camera. Mom didn't know how to use the movie feature until she accidently turned her digital camera on to movie mode and took a picture. After that she has been wandering around filming everything that moves around the house, including me playing with my laser pointer. If you want to join me for Weekend Cat Blogging, leave me a comment and I'll be doing the round up on Sunday afternoon. Blogging By Mail: 10 Fantastic Small Things! I Voted Today. Did You?